1 Peel and quarter potatoes, then cook in a small pot of boiling salted water, covered, until knife-tender, about 20 minutes. 2 Meanwhile, melt half of the butter in a large pot and add the flour, whisking constantly, and cook briefly to make a roux. 3 Whisking constantly, slowly add 550 ml (approximately 2 1/4 cups) of milk and simmer over low heat for 15 minutes. 4 Drain the potatoes, return to pot and let steam evaporate off the heat. 5 Mash potatoes with a potato masher. Add remaining butter and stir in milk. Season with salt and pepper. 6 Rinse dill, shake dry, pluck fronds, chop finely and stir into the milk mixture in pot. 7 Remove any bones from both types of fish, then rinse, pat dry and cut into about 3 cm (approximately 1-inch) cubes. Season with salt and pepper. 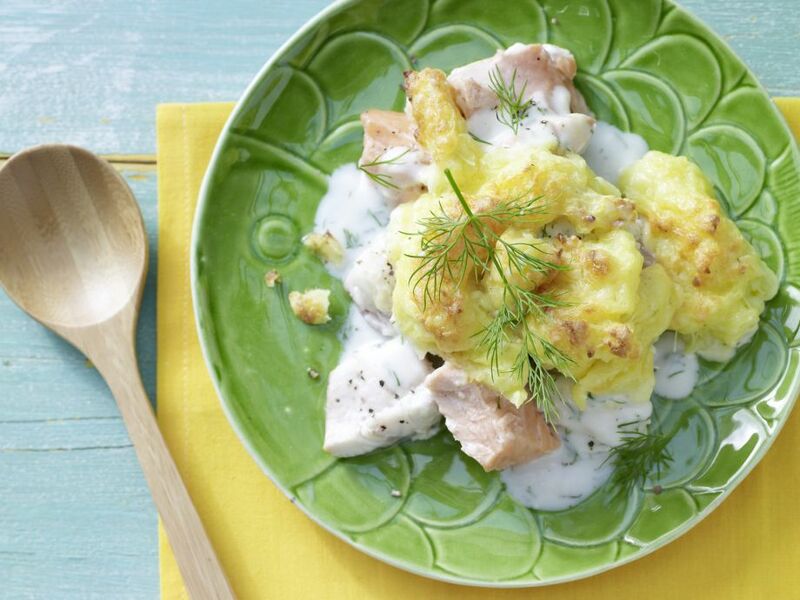 8 Distribute fish in a baking dish, spread with dill sauce and then top with mashed potatoes. 9 Grate the cheese finely, sprinkle over the fish casserole and bake in preheated oven at 200°C (fan 180°C, gas: mark 3) (approximately 400°F) until golden brown, about 40 minutes. Let cool slightly before serving.